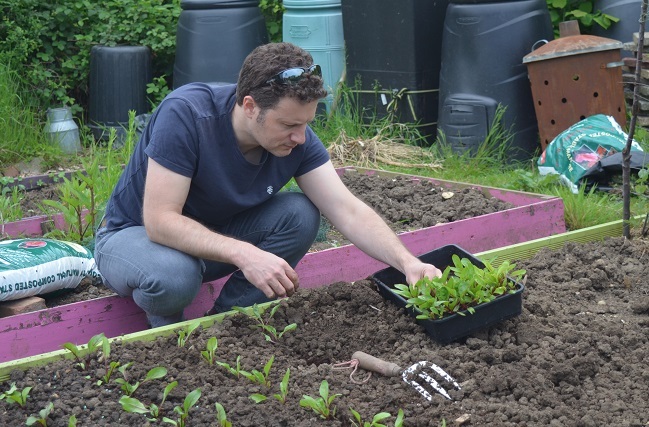 Planting out is one of my favourite things, as well as a blessed relief from digging. 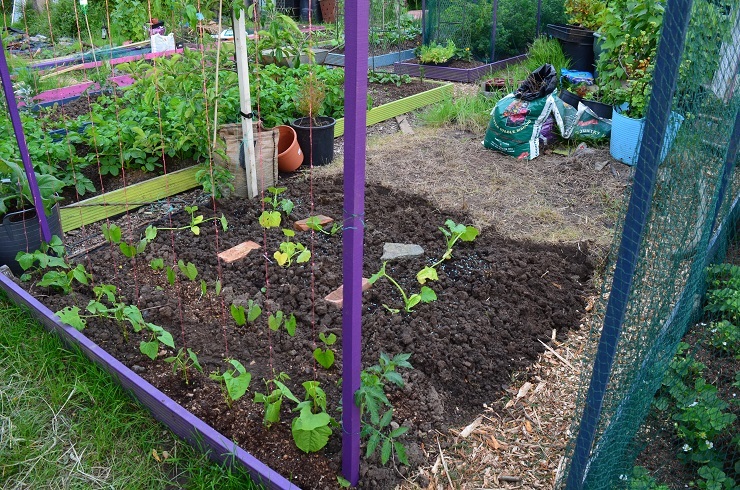 I’ve had help – Himself came up and put in 3 rows of Crapaudine beets, as well as fixing my legless arch securely enough to take a few climbing squash. Given that this might be disbelieved, I have photographic proof. He even said he enjoyed it, which leads me to believe that I can inveigle him down there again. The beets have been joined by 14 leaf chicory plants, which should keep us in piadina filling all season, plus some for the freezer. 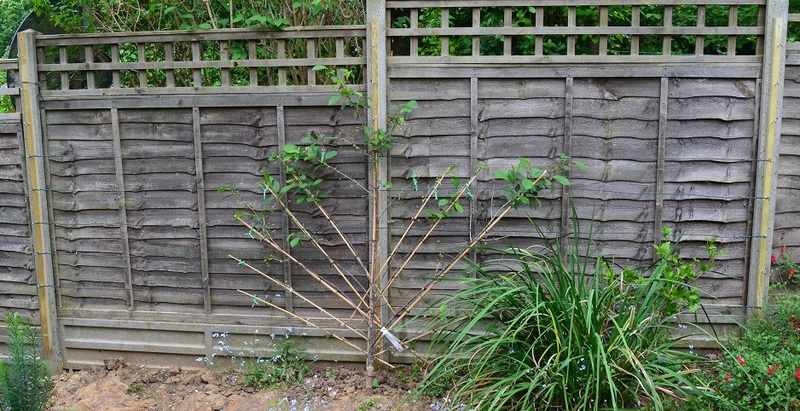 We also planted out one of the Doyenne du Comice pear trees. This arrived as a short twig in 2013 and has been living in a measly pot since then. Despite the neglect it’s managed to get to 6ft and also produce 4 pears this year, so it’s obviously a trier. There have been more changes. The Heritage Seed Library bean trial has been composted. The beans were feeble and already being over-run with ants bearing aphids. It seemed pointless to continue. 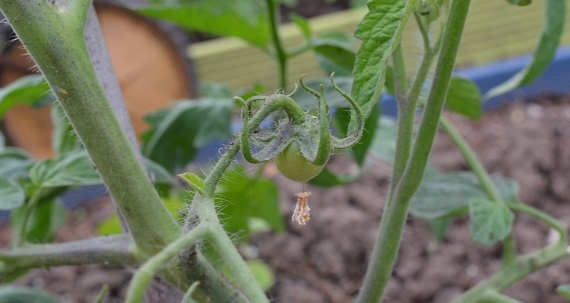 In their place are turnips, Crimson Crush tomatoes (already bearing baby fruit) and squashes – Potimarron and Japanese Pie. Plus a selection of cucumbers and gherkins to climb the arches. There’s progress too under the big Munty. I’ve been channelling my friend Michelle’s style: ripping off topgrowth, removing the worst weed roots and upending each spit of soil. 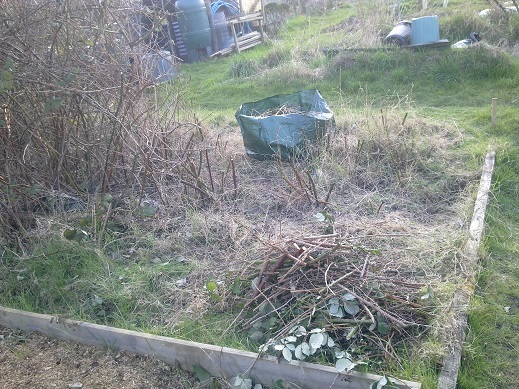 This bit was thick bramble when I took the plot on. This way of digging is at least faster. We’ll see how much weeding it involves later in the season. 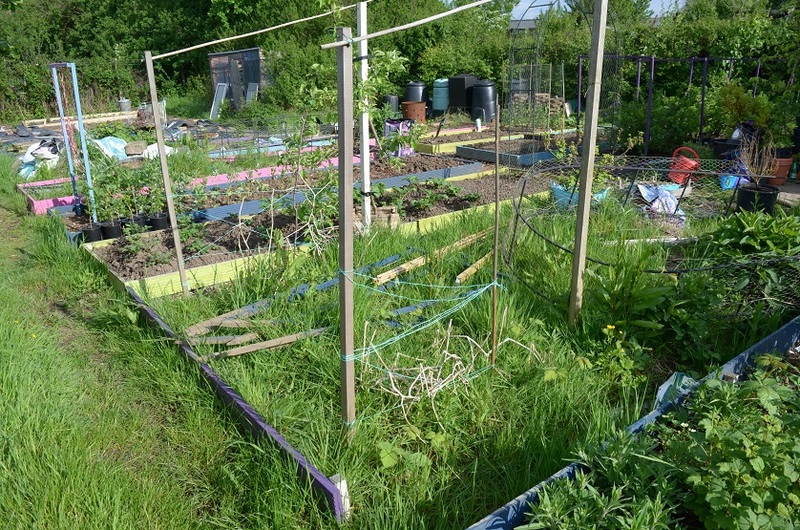 Both the fruit beds are wearing their bird netting with pride. Our site’s sparrows are ninjas though. 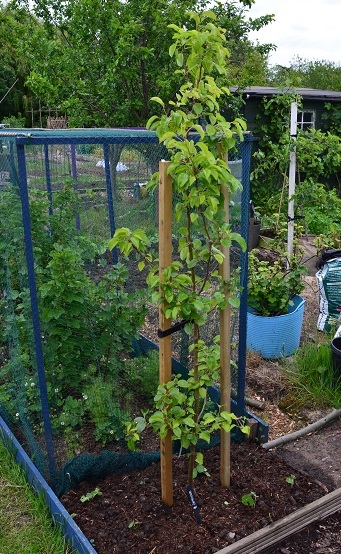 One got into the gooseberries somehow and was fluttering about on Saturday morning – I’ve increased the amount of tent pegs to try and remove any hidden entry points. Plus I check all the nets each time I am up. Fingers crossed it doesn’t happen again. 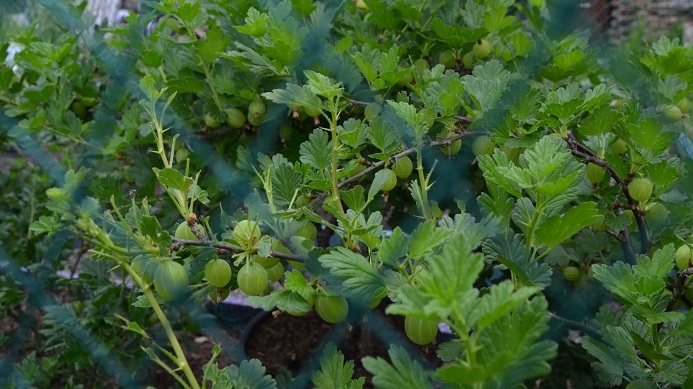 There is an impressive gooseberry crop brewing. But I am on a heightened beastie alert. I have seen gooseberry sawfly caterpillars, which I’ve not had since summer 2013. They were only on one of the red bushes, and I am hoping that it was an isolated cluster of eggs. I picked off (and squashed) about 15 of the beggars, but they were all fairly big. It’s very possible I missed some smaller siblings. I’ll be checking regularly given how quickly they can defoliate a plant and how many plants are crammed in there. The turnips hidden amongst the raspberries on #92 don’t ha ve leaves anymore. Ruddy pigeons weren’t fooled. And I’m assuming my Extra Early Wight really is extra early and pretty near time to be dug up. Which is great because I need the room for a second saffron bed. The Great Pea Wall has come down to make room for the rest of the tomatoes and sweet peppers in the greenhouse. 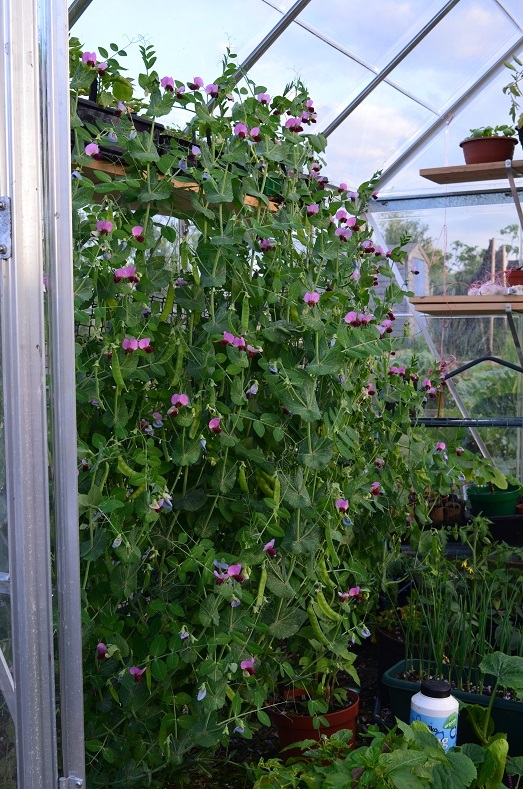 It was a bit of a wrench to take it down in full flight but in its short life 20 plants produced nearly a kilo of mangetout, mostly in May. One to repeat next year I think. Latah and Principe Borghese tomatoes are in large buckets and will stay in the greenhouse for a while. I also need to find room for the pepinos and at least one cape gooseberry. Thankfully my brother’s planting a new garden and I’ve annexed large pots their box plants came in. Over at Mum’s I’ve built my first post and wire system for her new fan-trained morello. It was so much quicker and less complicated than I had thought – I’m now really looking forward to building a couple of frames on my plot. It looks really good too. We just have to suss out the netting. Sowed at home while the rain came thumping down: swedes and gilfeather turnips, stevia, PSB, Nero di Toscana and Vates Blue kale. The chufa haven’t germinated, but the giant achocha and kiwano have, which is nice. How come Piero gets to plant and on my visits I’m consigned to digging, weeding or chopping things down, or if I am very good to watering!! !